Will Apple make an iPhone 8S next year? Something occurred to me while replying in a different thread. Typically, the S model iPhone is an internal upgrade from the numbered model whereas the numbered model brings new internals and a new design. With that in mind, if Apple introduces an iPhone 8S next fall, will it still have the bezels and the fingerprint scanner? What are your thoughts about it? Last edited by Just_Me_D; 10-29-2017 at 01:48 PM. I guess they will go all in and ditch that badly aging faceplate, like almost all other companies are doing. Maybe they should keep a smaller version of the X with slightly less features (like no wireless charging) and a competitive price. Don’t know bout the name, it’s confusing. I think they’ll keep the design of the 8 in the past and continue on with the design of the X. Depends on what you mean by 8s. I see all iPhones going to the same design as this year's X model. If not next year, then in 2019. When may depend on availability of the oled screens. Who knows? I don’t understand Apple’s naming conventions anymore. I’ll reiterate my thought from other threads that Apple will completely do away with numbers. So we’ll have three models released in 2018: iPhone, iPhone Plus and iPhone X. Much like Apple has done with most of their other devices we’ll simply have a new iteration of each model (i.e. 2018 iPhone X). This year really confused me on what Apple would do in the future years. 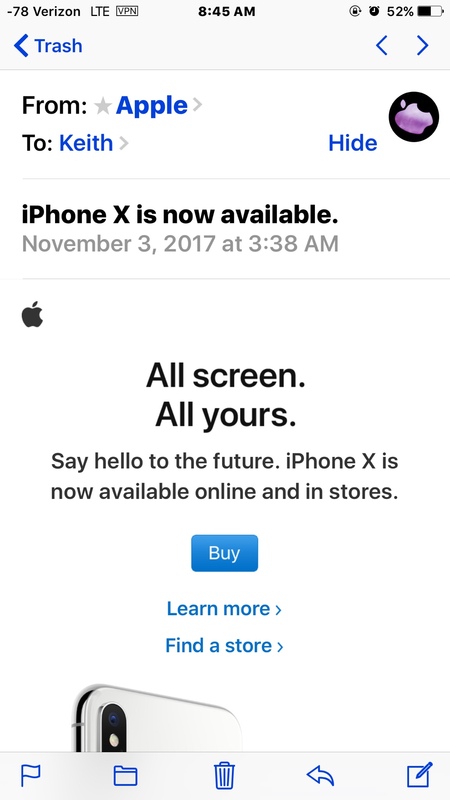 They seemed to create a completely differently product line with the X. I honestly don’t see them continuing the 8 line. I see them going all in with the X once they get that device figured out from a design perspective. Really couldn’t see many more phones from Apple with the same design as the 6/6 Plus. I’m unsure of what Apple will do with the X but I believe they’ll keep the 8 form factor & that will become the new SE. Apple says it all in their ad! "Say hello to the future"
I don't think that means only one device. It's where the iPhone is going with all size options, except maybe the SE. I hope it does. That’s the one I’ll get. It’s been what....four months?.....and I still HATE. THAT. NOTCH. I don’t regret the purchase because it was a first generation device so I’ll keep it and won’t pass it down to family in September. But I REALLY don’t like it. My 8 Plus is my baby. If there’s another in that style then that’s what I’ll get, even if it doesn’t have the latest and greatest features. Contents Of iPhone X box? Which color Apple Watch Series 2 should I buy? Has this happened to anyone with an 8 plus?